Thursdays are my favorite day. It’s the only day of the week when I don’t have to go to Towson. I sleep in (until 8:30 am.. wild), stay in my pajamas all day, do laundry, get homework done, and get to watch Live with Kelly! All very exciting. Does anyone else think NPH should be her permanent new cohost? I do. I’m not hating Josh Groban today, but don’t give me a stranger. I’m not interested in that. And as someone who watches one day a week, I should definitely have a say. Tuesday I had one of those terrible horrible days when I had to run a bunch of undesirable errands. In the rain. Woe is me. I had to go to the DMV/MVA to transfer Valerie’s old license plates to my new vehicle, who I’ve lovingly named William. He’s a little prince. Then I had to go get a background check and fingerprinted because someone thinks it’s a good idea for me to have my own patients next semester WHAT I don’t know anything. Then while I was already in the slums of Baltimore I decided to go to the Target there, which didn’t exactly resemble my Fairmount love. And topped it off with a trip to Shoppers. Woof. I hate that grocery store. 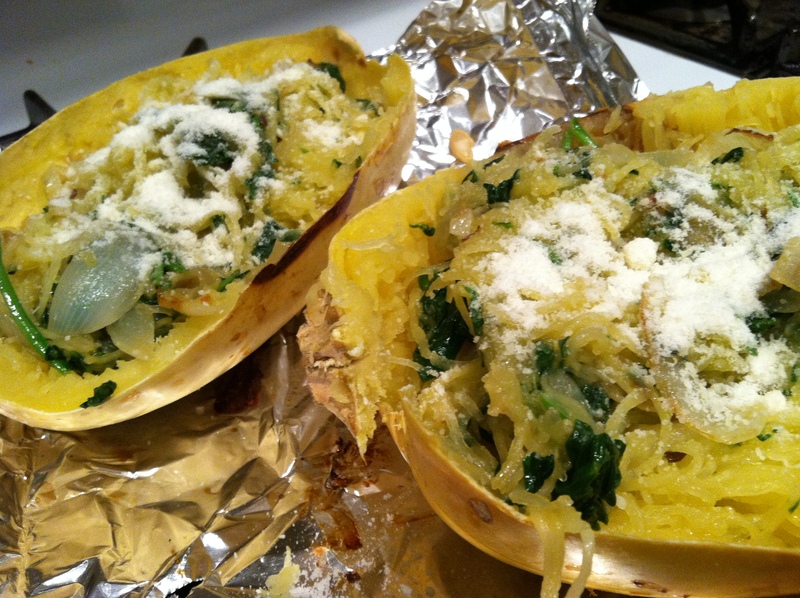 Then I made spaghetti squash! Again, my story has nothing to do with the food, other than I decided to give the produce department in Shoppers another chance after freaking out on Saturday that they didn’t have scallions. 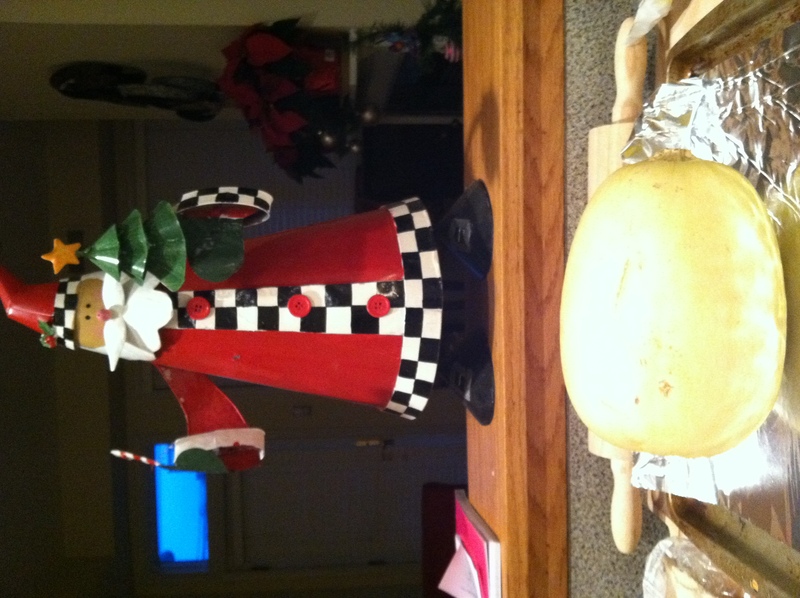 And picked up this big honking squash because I thought it would be cool. And it was! that’s our dancing santa. he’s rowdy. For the sake of being truly original, I mixed in some butter, onions, garlic, and spinach. WHOA- novel flavors. I loved it though. I ate the rest of it in my car yesterday, cold, on the way to Body Pump and it was still good. I’m tempted to try it with sauce and meatballs just to make a judgement about whether it’s really a gluten free option for pasta. Plus I’ll eat anything. 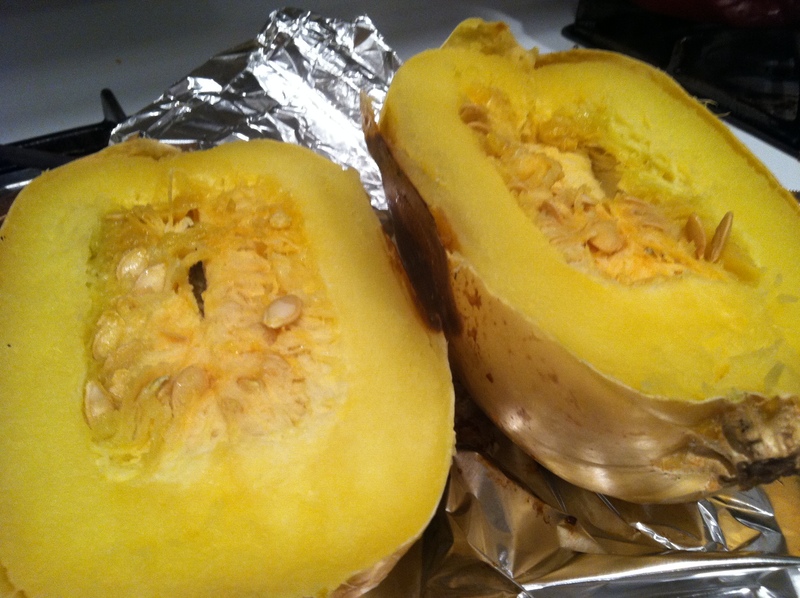 Poke the squash with a fork a few times, then put it on a baking sheet and roast in the oven for an hour or so. Let it cool, then slice in half the long way. Or, don’t let it cool, and hold a sharp serrated knife while wearing an oven mitt. Safety tips 101. Scoop out the seeds, then use a fork to scrape the sides to get the spaghetti strands. It’s like magic! Put the squash in a strainer to drain some of the liquid. Cook the onion until translucent in the butter, then add garlic and spinach. Cook down slightly then add the squash back into the pan. 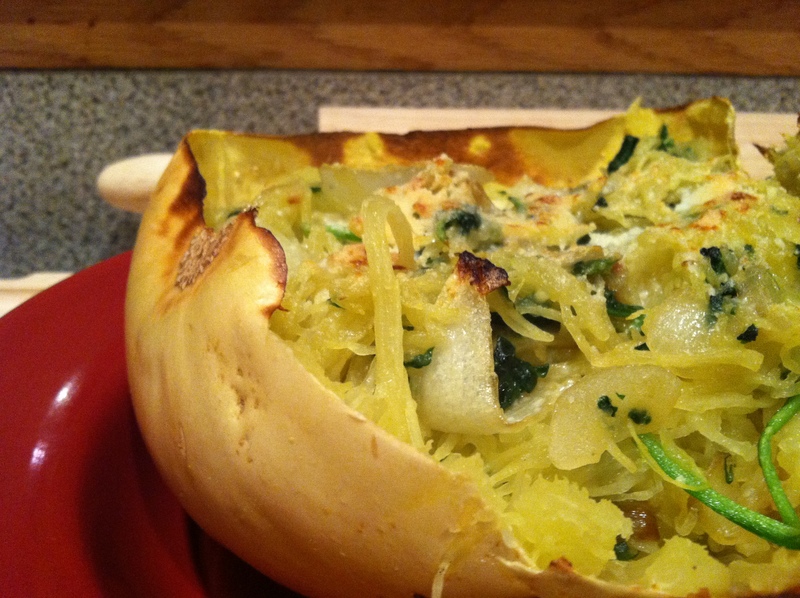 If you’re feeling fancy, scoop the mixture back into the squash skins. Top with parmesan cheese (or any other cheese.. and maybe bacon..) and put under the broiler for a few minutes. This was delicious and very filling. Probably because it was meant to feed four, but still. Fabulous. Then I made a new dessert in the effort to procrastinate studying, which I’ll share with you soon. In the mean time, life lessons: a quarter can be a screwdriver, vegetables can be pasta, and I changed my mind I want Anderson Cooper.